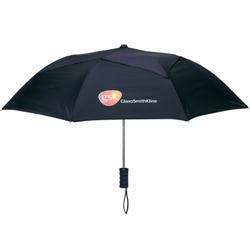 One of our most popular promotional umbrellas. 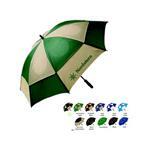 42" arc auto open folding umbrella with vented technology. Rubberized handle for secure grip in high winds. Available in black, navy, hunter, black/white, and royal/white! FREE 3-DAY RUSH PRODUCTION AVAILABLE! Wait, too many options? Not enough? Forget the browsing and call our professional staff – we’ve touched all these items and know the quality levels! Available Colors: Black, Navy, Hunter, Black/White, Royal/White. Available Imprint Options: Panel Imprint, Tie Imprint. Fabric: Nylon, Shaft: Steel, Handle: Black Rubber, Cover: Vented, Auto/Manual: Auto. Carton size: 17" x 17" x 9 1/2"
Carton pack: 50 units, Carton weight: 41.14 lbs.